30-year-old mother of young children dies in car crash near Modiin. A 30-year-old woman died Tuesday morning in a car crash on Highway 465, near the city of Modiin. The victim has been identified as Odelia Finkler. Two cars hit each other in a head-on collision. The driver of the other car suffered light injuries. 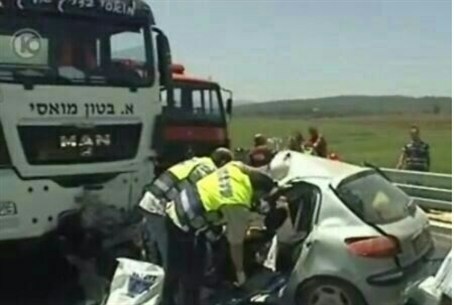 The crash occurred as Finkler made her way to work in Kibbutz Nahoshim. Her husband Ariel was informed of the tragedy in the Tzelim IDF base, where he was serving in the reserves. Finkler is survived by her husband and two young children. A funeral will be held at 5:30 p.m. Tuesday in Modiin. Finkler’s father-in-law, Kobi Finkler, writes for Arutz Sheva and works with Radio Kol Chai. Her brother-in-law, David Finkler, works for Besheva, Arutz Sheva’s weekly newspaper. Besheva chairman David Saado expressed his condolences. “[The Finkler family] is a wonderful family. We are all pained by this, this is a terrible tragedy,” he said.